Curious and cramped. Two words to describe my teammates and I in the van ride from the airport in Liberia, Costa Rica to Playa Samara. 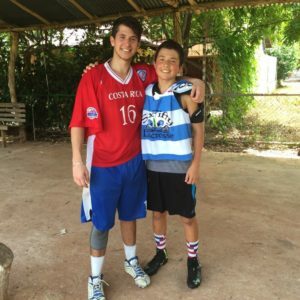 My lacrosse team, SixFifty Lacrosse led by Matt Bond, was headed on a “Lax and Serve” mission to better the lives of native children living in impoverished communities along the coast of Central America. With the service, came an unforgettable experience to play against the Costa Rican National Team; a group of athletic guys with a passion to play lacrosse and an eagerness to learn from Americans like us. After a 2-hour drive through small beach towns and pastures full of grazing cows, we arrived at the Tico Adventure Lodge, our home and locker room for the next 7 days. It would be an experience that would change me forever. During that week, we touched the lives of many children, from the shy to the ambitious. We traveled to El Torito School and led an arts and crafts workshop with the kids. Although the sweltering heat and humidity got to us, we quickly realized the impact we were making. Kids giggled as we built popsicle stick towers, painted butterflies, and weaved on rainbow looms. And then there were the lacrosse clinics, where we taught basic skills such as scooping and passing, and played games like “hungry hippo” and “steal the bacon”. It was amazing to see the exhilaration in each kid, and to know that we were helping to put smiles on their faces. Apart from the children, we painted an entire playground to give a sense of vibrance to the run-down structure. It was a time of comradery and team bonding, as well a chance to splash each other with fresh paint. It was a great opportunity to witness our immediate effect on the school and the kids. As soon as our van drove away, the kids swarmed the playground like bees to honey. One of the highlights of our expedition was getting to meet and play against the Costa Rican National Team. They came from all over Costa Rica, with nothing but sticks and incredible drive. Ranging in ages 15-45, it was a joy to learn about their humble beginnings and to share our own love of the game. The scrimmages had a competitive feel, yet no one was out for blood. It was about making friendships and learning from one another. Whether on the field or having barbecues back at the Tico Lodge, the great people, vast culture, and love of lacrosse made for a fantastic experience. In the what seemed like countless days with the people of Playa Samara, I retained two concepts that I will forever carry away in my mental briefcase. The two-hour bus ride, two flights back home and weather delays gave me ample time to reflect on my experience. Whether it was piecing together craft guns or chasing after lacrosse balls, I saw a constant gleam of elation within each and every child. It was an emotion that was full of life, intent on finding fun in the most simple places. The most surprising thing was the fact that in a place with poverty, crime, and little resources, there was an unbelievable amount of anticipation and happiness to see “what the Americans would bring us next.” I felt guilty when I thought about the times I had complained about my home, food or possessions. These kids had close to nothing and were forced to live under tin roofs. I have now begun to truly appreciate what I’ve been given over the years. These kids opened my eyes with their laughter and humility. That’s infectious to an American teen like myself. Surrounded by the culture of a Costa Rican beach town, I now have experienced the true essence of living a “pure life” or “Pura Vida” as the natives say. Away from the hustle and bustle of the Bay Area, I was able to unplug and live life without a constant buzz on my phone or news story flashing on the television. I boogie-boarded in the crystal-blue waves of the Pacific, ziplined through jungles full of howler monkeys, and visited a sea-turtle hatching conservatory. It was an experience never to be forgotten. Drama from friends, family, school, and work didn’t dampen the Costa Rican vibe. It was a place free from noise. The kids screams of “pelota, pelota” were music to my ears. If only life in California could be that simple. Overall, the Costa Rica “Lax and Serve” was an experience that I will always remember. Whether it was playing lacrosse on the beach or just hanging with the National Team, I will now have a new perspective on my own life and the people around me. I will be grateful for the things I have been given and strive to serve those who have less. For it’s a waste to not travel though life’s journey without a little “Pura Vida”.